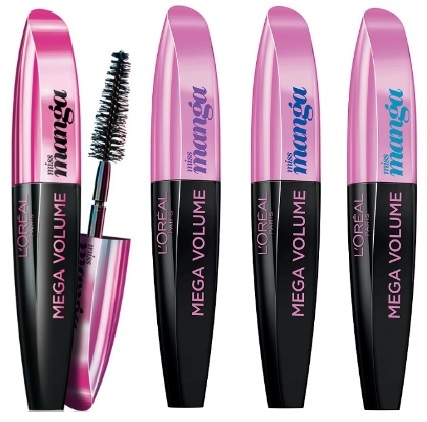 L'Oréal Miss Manga by Voluminous Mascara - $10.99 - available in Black, Blackest Black and Brown Black - as well, there will be 3 limited edition fashion shades coming in August - Purple, Electric Blue and Turquoise. while the turquoise makes more of a dramatic statement so I paired turquoise on the top lashes with black on the bottom. Or turquoise become a little more wearable on the just the upper tips and outer lower lashes. The turquoise is clumpier then the black is but that is probably more because I used extra thick coats of it so the colour would really show up! Great review! I think I'll go grab the purple one. Wow the blue is actually so bright but a bit scary haha. I like what you did by putting it on the tips though! Ughh I'm so tempted to try this because I love Lancome Doll Lashes, and it seems very similar to that. It's on for $6.99 at Shoppers this week, so maybe I will just have to bite the bullet! !